It was a huge win for Big Bang supporters when, in March 2014, a team of astronomers claimed they had found direct evidence to support the concept of cosmic inflation — the super-rapid expansion of the Universe that occurred just fractions of a second after it exploded into existence. The discovery was monumental, completely altering our perception of the early moments of space and time. But alas, sometimes these things are just too good to be true. A joint analysis of data from the Planck space mission and the ground-based experiment BICEP2 has found no conclusive evidence of gravitational waves from the birth of our universe, despite earlier reports of a possible detection. The collaboration between the teams has resulted in the most precise knowledge yet of what signals from the ancient gravitational waves should look like, aiding future searches. Planck and BICEP/Keck were both designed to measure relic radiation emitted from our universe shortly after its birth 13.8 billion years ago. An extraordinary source of information about the universe’s history lies in this “fossil” radiation, called the cosmic microwave background (CMB). Planck mapped the CMB over the entire sky from space, while BICEP2/Keck focused on one patch of crisp sky over the South Pole. In March of 2014, astronomers presented intriguing data from the BICEP2/Keck experiments, finding what appeared to be a possible signal from our universe when it was just born. If the signal were indeed from the early cosmos, then it would have confirmed the presence of ancient gravitational waves. It is hypothesized that these waves were generated by an explosive and very rapid period of growth in our universe, called inflation. But the results quickly drew scrutiny from the scientific community, many of whose members questioned the BICEP2 team’s analysis. That’s in part because other phenomena in the universe can also cause B-modes, particularly the galactic dust that permeates our view of the cosmos. The BICEP2 team looked at light emanating from the cosmos at 150 gigahertz, and had found very low levels of dust. The signal, then, was probably due to primordial gravitational waves, they surmised. But data from the European Space Agency’s Planck mission suggest otherwise. 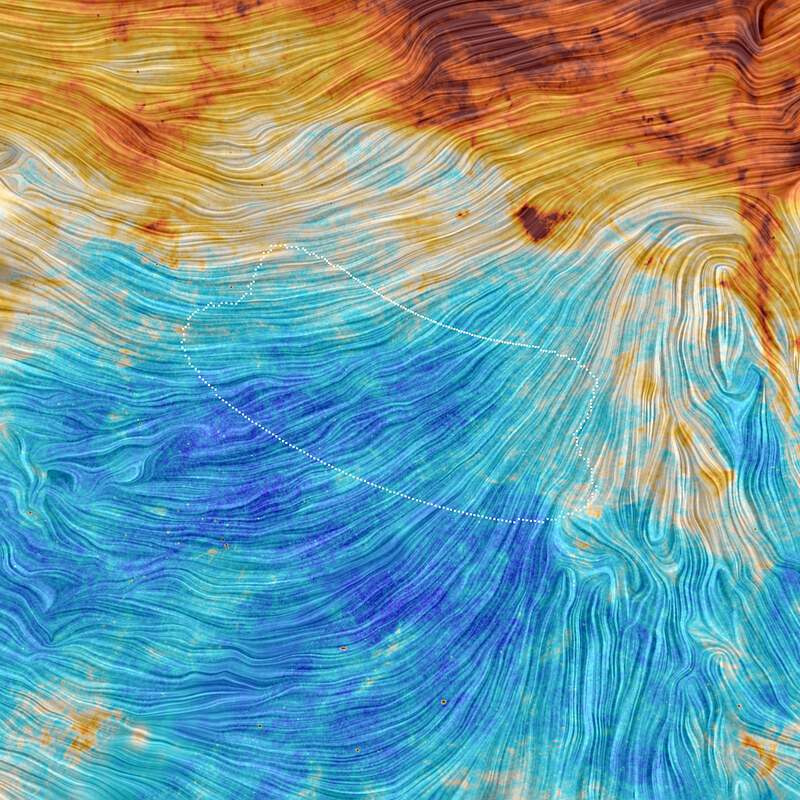 The Planck mission is mapping the dust across the entire sky, looking at different bands of light. They looked in nine different frequencies, seven of which had detectors that were sensitive to polarization, but the key frequency was the highest: the 353-gigahertz band, where the dust shines more brightly than at other wavelengths. The Planck team announced in September that they’d found polarized light in significant amounts across the sky – perhaps high enough to account for most of the BICEP2 signal. And now, after teaming up, the Planck and BICEP2 scientists have released a paper titled “A Joint Analysis of BICEP2/Keck Array and Planck Data,” which finds there’s no compelling evidence that the polarization signal described in March was actually due to primordial gravitational waves. Note: Mind you, I don’t necessarily have a problem with big announcements that are made when the scientists themselves aren’t sure what they mean. Specifically, I’m remembering the faster-than-light neutrino announcement, when the scientists said, basically, “Look, we’ve investigated this as much as we can, and we know it sounds crazy, but our results seem to say that FTL particles are possible. What did we miss?” They were very skeptical, and were asking for others to pitch in and see what they found. It turns out there was a loose cable in the equipment (yes, seriously), that messed up their timing experiments. Science is messy sometimes, and it’s made messier by the need and pressure to announce results… and the need and pressure on some of us to write about them. We all need to be more careful in the future.